× 3 = 15 Required Please enter the correct value. Unless a significant event happens, look for the Dow Jones Industrial Average today to take a bit of a breather as investors prepare for tomorrow's release of the February jobs report. While a weekly jobless report will offer some hint of what we might expect tomorrow, the unemployment rate is likely to have a significant impact on the U.S. Federal Reserve's pending decision on interest rates on March 16. With so much happening this morning, let's tackle your top stock market news, stocks to watch, and economic calendar for March 3, 2016. 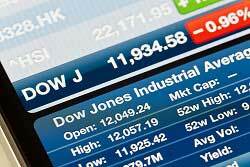 Dow Jones futures forecast a 13-point decline as investors prepare for tomorrow's monthly jobs report. A strong jobs report tomorrow could fuel expectations that the Federal Reserve will boost interest rates at some point this year. According to CME FedWatch, traders anticipate a 61% probability that the central bank will hike rates in 2016. Somewhere, activist investor Bill Ackman is smiling and enjoying his breakfast. That's because shares of Herbalife Ltd. (NYSE: HLF) fell nearly 15% this morning after the firm announced that its new membership figures were overstated. As we've said repeatedly, the low-interest-rate environment is fueling more and more merger and acquisition activity. This morning, shares of Tumi Holdings Inc. (NYSE: TUMI) swelled more than 17% on news that Samsonite International is exploring a deal to purchase the rival luggage maker. Oil prices are on an absolute tear, rising 35% in the last month. However, this morning, crude oil prices slipped slightly as concerns about global oversupply weighed on trader sentiment. Yesterday, the U.S. Energy Information Administration reported that crude inventories surged by more than 10 million barrels last week. Overall, U.S inventory levels hit a new record of roughly 518 million barrels. Shares of SunEdison Inc. (NYSE: SUNE) fell in pre-market hours after the renewable energy giant announced plans to suspend its quarterly dividend on preferred stock. The firm is under pressure from lenders – who are withholding funding for its pending purchase of Vivint Solar. Shares of Vivant were up 3% this morning. The short sellers are on the attack, but TSLA stock remains a strong long-term buy. Yesterday, shares of Tesla Motors Inc. (Nasdaq: TSLA) came under pressure. Don't buy the hype. The stock remains a buy, here's why. Shares of Chesapeake Energy Corp. (NYSE: CHK) pared gains in after-hours trading yesterday after surging as much as 33% during the normal session. The decline came shortly after news broke that the firm's former founder and CEO Aubrey McClendon died in a single-car crash. His death occurred one day after the Federal government charged McClendon for conspiring to rig oil and natural gas bids and violating antitrust laws. Dallas Federal Reserve Bank President Rob Kaplan speaks at 10:45 a.m.